One every 10 minutes, don’t make me cry. The amount of times we waited for the 65, watching taxi after taxi flash by thinking, shall we stop this one? ………… nah! There’s got to be a 65 along soon. How wrong can you be. 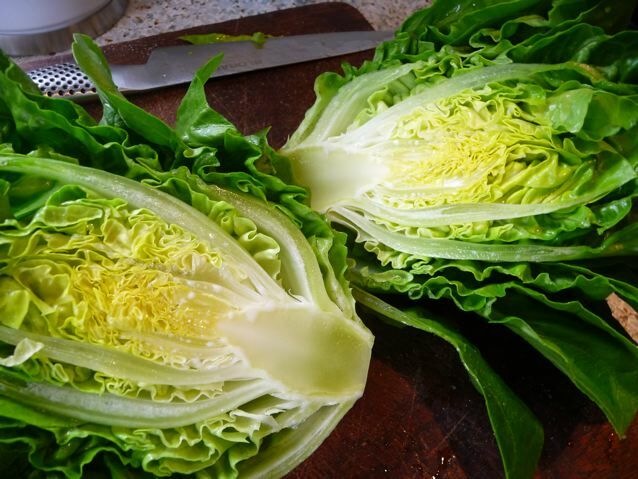 Your lettuces look delicious, both cooked and raw. Aren’t they glossy, Joanna. Mine are getting a little moth eaten on a couple of the edges, but are so tasty. The rocket’s producing very pretty flowers at the moment too. That bus and me go way back Gill! I wanted to find a picture of an old routemaster 65… It used to go to Chessington Zoo too when I was a child. I will definitely be making that lettuce…it looks wonderful. But I am absolutely amazed by the beauty of your garden… very very impressive! If you only knew the trouble me and my beloved go through with ours, we are the world’s most pathetic gardeners! Lynne, I haven’t tried griddling leeks, sounds delicious! I use nematodes for the slugs and a torch on a dark damp night for the snails. Sally, the veg bed is a metre wide and waist high and therefore easy to manage. Being raised, the soil stays warmer I think. Maybe 10 square metres in total. Gets overcrowded very easily. 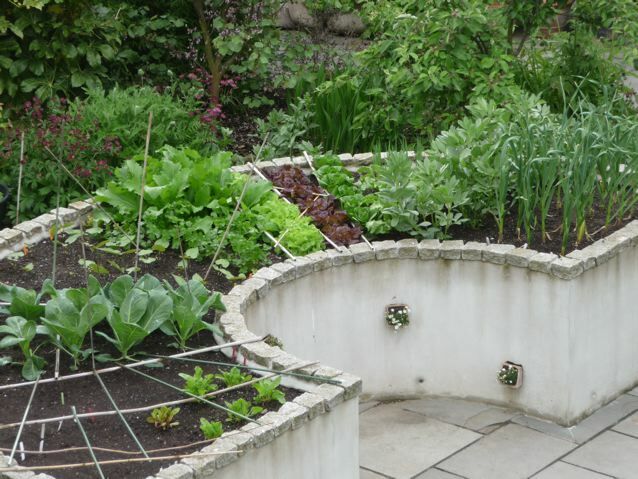 Raised beds are worth looking at…. What sort of climate do you have, Sally, apart from tornados? We do have a raised bed, hubby built it 3 years ago – the problem is… we are not very good with plants, what can I say? Tornado season is over, that’s great! So hot climate plants. Basil would love you, dwarf french beans, artichokes maybe, they might be fun to try and figs and all those lovely marrows and squashes that my summer is never long enough or hot enough to grow well. Does it get really cold in the winter too? I don’t really know much about veg growing zones, and( like the photography) Brian is better at it than me. We are mild and damp here, with the odd hot week. I think I’ve got to cut all those lettuces and give them away this weekend, they are so big now. And I had some mustard leaf, that’s gone mad too, I put some in some bhajis the other day..
Joanna is there anything your are not good at? Every shot of the plants in your garden shows a perfect leaf colour and form, flower, produce. 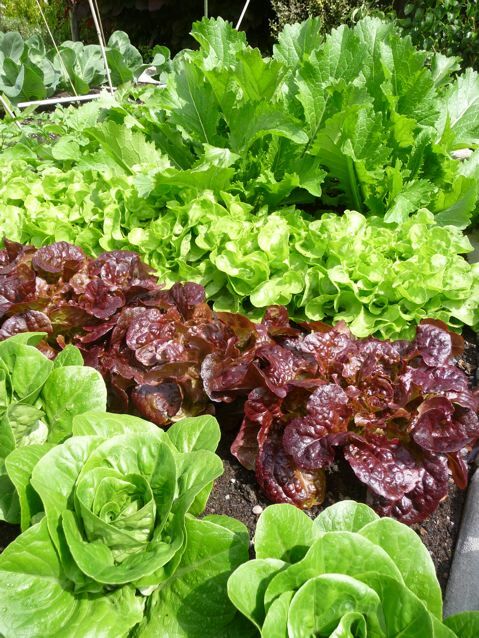 When I saw the photo of your lettuces yesterday, I just couldn’t take my eyes of it … absolutely beautiful. No little nibbled edges, no dust stains, no holes, no shredded leaves after the birds have had their fill. And I can see in the background that you have cabbages which look like they’re made of silk they’re so beautiful and untouched. So tell us your secret – do you cloche and net them as well as the nematodes? Do you want to see pictures of holey leaves? 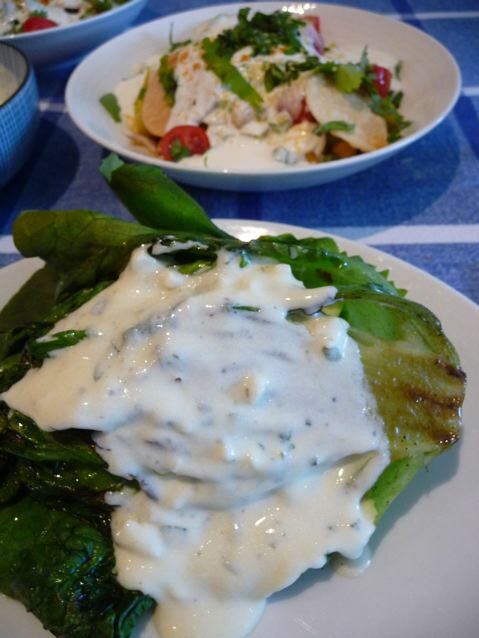 I can go out and take them :) The lettuces are unnaturally good, I will admit, I am a bit bewildered by them myself. But the broad beans are covered in black fly, snails have munched their way through the hostas. It had just stopped raining when I took the lettuce shot, so they were all washed and shiny. And I think that the long cold winter, the first one in ages, has killed off a lot of the bugs and things. The veg bed is small and cossetted and the garden faces south east and is fairly sheltered being in the suburbs. Mm, what else do we do? We lay canes across the width of the veg bed and that stops the pigeons walking about in there too much. https://zebbakes.files.wordpress.com/2010/06/p1030451.jpg And we have two resident bird and squirrel chasers of course….. A small amount of home made compost… in an earthmaker thingy…. As to things I am not good at…where would you like me to start? Oh, how envious I am of your wonderful lettuces – they look so tasty. I’ve tried sowing lettuces every two weeks for the last 3 months and not one has come up – I can’t understand it. Have used different seeds from different packets – bah! 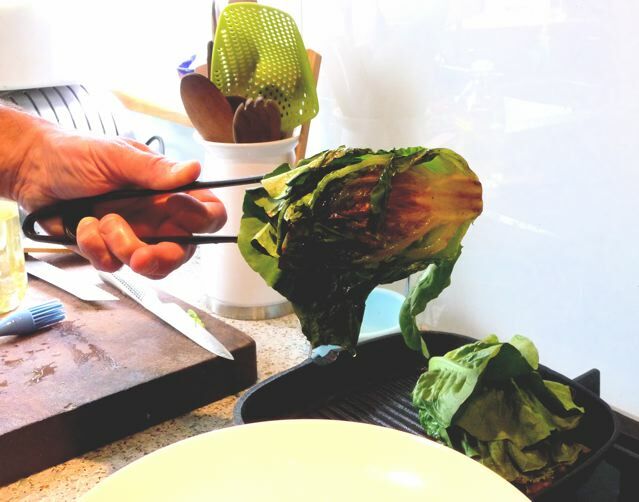 Have heard that grilled lettuce is good, though have never yet tried it. I guess griddled is much the same. Brian says possibly sowing them too deep, do you have birds, especially pigeons or rabbits, mice that could be eating the seed? Is it a fresh patch of soil from where you grew them before? Other thing is to sow them into plugs and then plant them out when they have their second pair of leaves, we did that last year and you can protect them better that way. Ooh it’s like Gardeners’ Question Time here. And, oh he is a cynical man, now he says are the seeds all from the same shop, could be they are selling old seed or they have stored them at the wrong temperature in the shop and it is nothing to do with you. I like that last thought. You can tell the suppliers if you can be bothered. He is getting carried away now, he says do a test row of radishes, have you tried the cut and come again sort and the little gems are pretty good…. And if it is too hot then it won’t happen either. Phew, he’s wandered off now. I think Sally calls it grilled, but I calls it griddled. Maybe an American/Brit english thing. Goodness, thank you for the lettuce advice. It could well be pigeons in our garden now you mention it – they are always hanging around there as that’s where the bird feeders are. They could be down at the field too I guess, where I’ve done most of the sowing. Haven’t had a problem with any other seeds coming up. No, the seed has been from various places – although to be fair some, though by no means all, were not this year’s seed. I’m reluctant to use plugs, but might just have to give in.